A few weeks ago I wrote about Pandemic and raised questions about its long-term sustainability as the entry-level cooperative game and questioned whether it has legs and will hold up to the new titles in the genre. In the past week or so I’ve gotten four games in of Black Orchestra, the new co-op by Phillip Duberry and Game Salute. It seems to be getting a little lost in the horde of new games, but Black Orchestra is an amazing breath of fresh air for me- someone that has enjoyed Pandemic but have wanted something new. Black Orchestra is a more traditional co-op in the same vein as Pandemic in the sense that it doesn’t use real-time or simultaneous action mechanisms like a lot of newer titles in the genre. Many designers are recognizing the alpha gamer problem that traditional cooperatives like Pandemic have and using these mechanisms to prevent this problem. The designer of Black Orchestra did virtually nothing to prevent this problem and in despite this created an amazing design nonetheless. 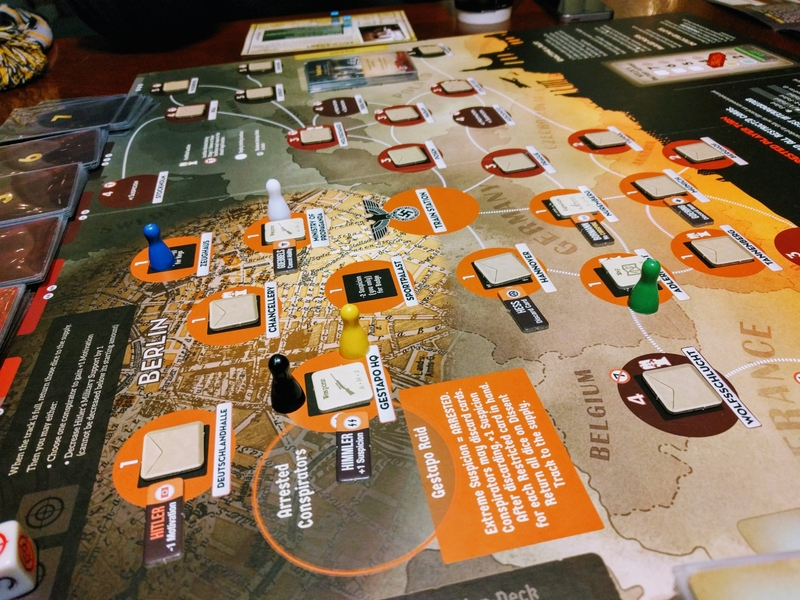 Players take the role of members of the Black Orchestra, historical people who, in one way or another contributed to at least one plot to kill Hitler. Each character is one of three categories: Wehrmacht, Abhewer or Civilian, and has a special ability. Nearly all of the components in Black Orchestra are designed superbly, especially the character cards, which are both eye-catching and provide a bit of historical background about the character. This was particularly interesting to me, as I discovered that the famous theologian Dietrich Bonhoeffer actually contributed to the plot to assassinate Hitler from inside the Abwehr (the German military intelligence agency). 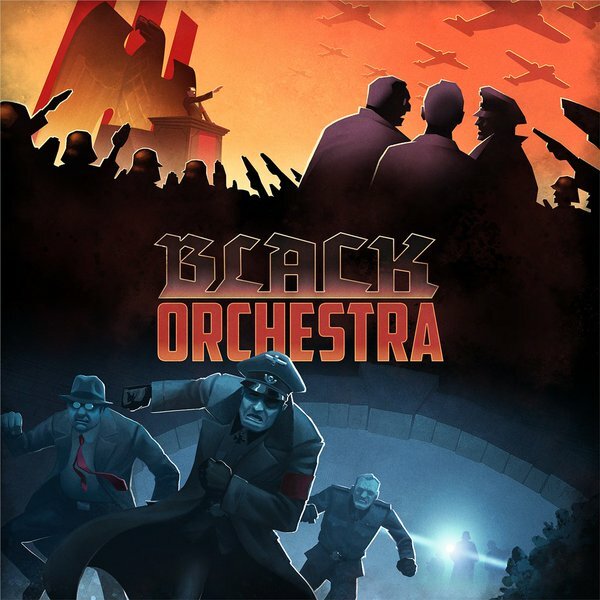 To put it simply, Black Orchestra is absolutely Rich with historical theme and the game is all the better because of it. Back to gameplay though, ultimately, players must activate a plot card and roll a number of dice based on the number of conditions met on the card- the more dice rolled, the greater chance the players have of killing Hitler. To fulfill the conditions and add more dice to assassination attempts, players must move around the board, collecting items and drawing cards. Items can be exchanged between players as you would expect, but sometimes you may need to deliver an item for the Reich to keep your suspicion down and avoid being jailed by the Gestapo. This creates and interesting delimma because sometimes the very items you need to kill Hitler are the same ones that will keep you out of jail, and if everyone is in jail at the same time the game is lost. 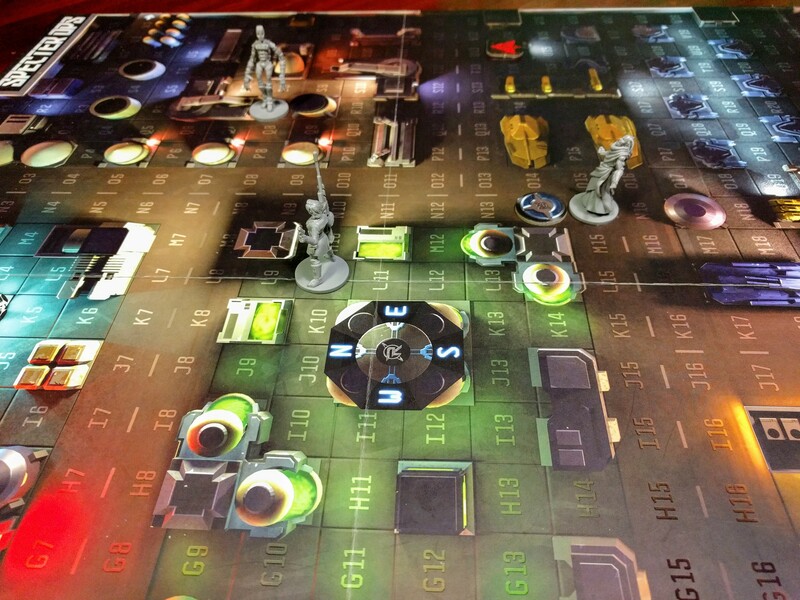 The most interesting aspect of the game for me, however, is the conspire action. Using this action, a player can roll up to three dice to potentially gain more actions (instead of just the default three) or accumulate target symbols to lower Hitler’s military support or allow a player to gain motivation. 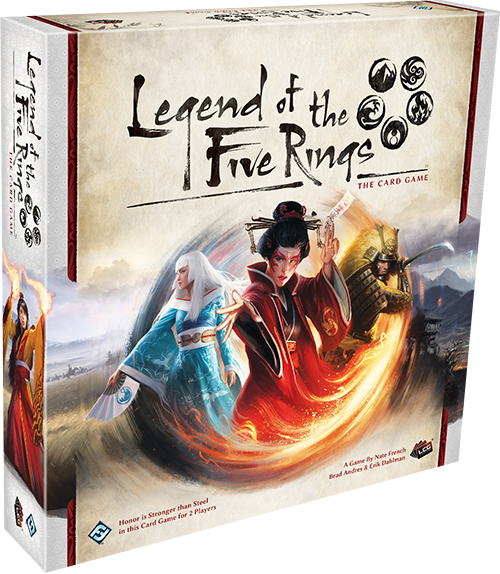 This push-your-luck dice rolling mechanism adds just the right amount of tension and choice to the game that would otherwise fall slightly flat. The game almost never feels completely lost because you could potentially get just the roll you need to make things happen, whether that is loads of extra actions or the targets to weaken Hitler’s support. On the flip side, each die has a Nazi symbol on it, and each one rolled when conspiring increases your suspicion. Rolling well or horrible when conspiring can completely change the game either way. 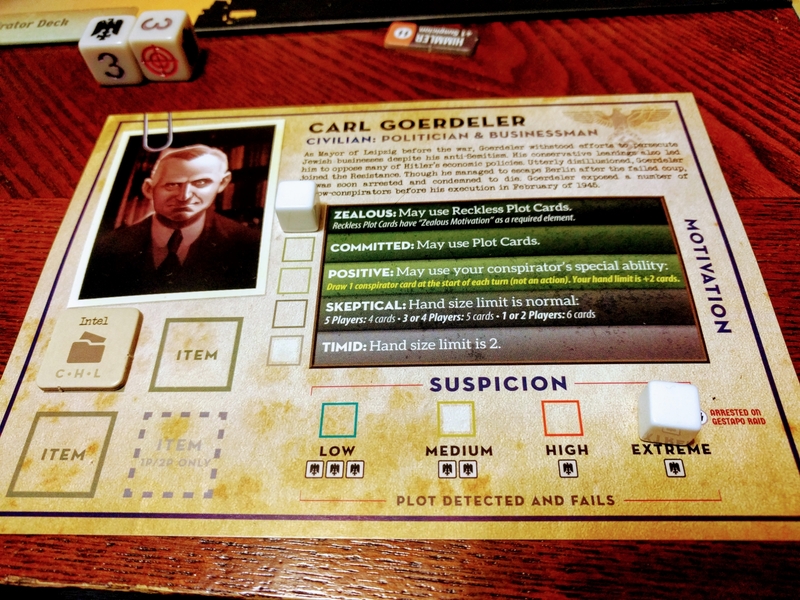 In addition to the conspire action, Black Orchestra consists of seven phases, each with their own deck of event cards. Each game, two cards are removed from each stack of event cards, which can make the game incredibly difficult, or very forgiving depending on what cards remain and in what order (although more likely than not it’s going to be somewhere in the middle). I should also note that the event cards are busting with historical theme as well. Ultimately, the conspire action and the event cards are the cherries on top of this beautiful design that makes Black Orchestra much less deterministic than Pandemic, and instead makes you feel like anything can happen, on any turn. The alpha leader problem could definitely be an issue with this one, so this is one that if you’ve played it before, you’re probably going to want to facilitate a game for newbies before joining along with them. In that sense, it’s not all that different from Pandemic. 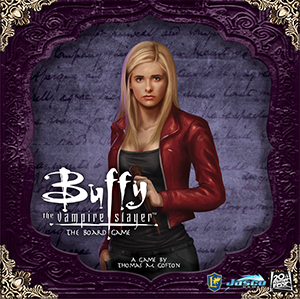 However, if you’re looking for a new cooperative game, especially one with historical significance, look no further. 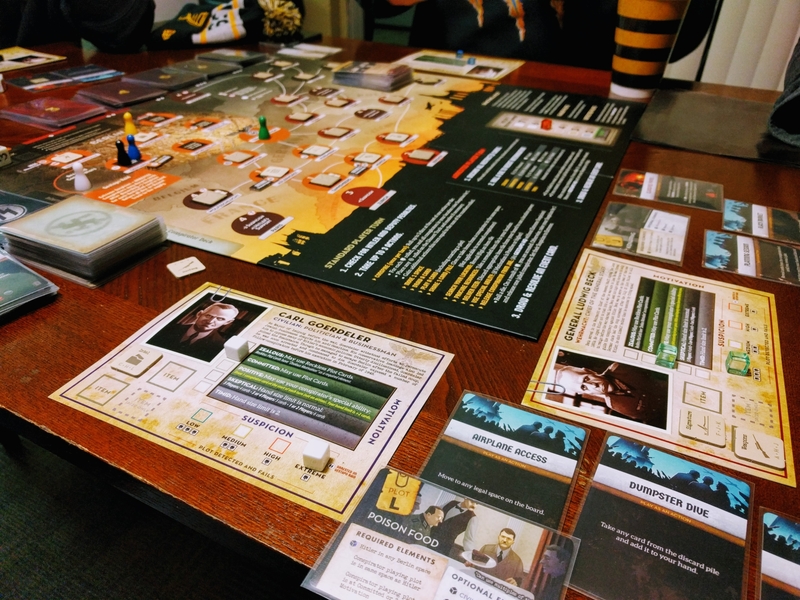 Black Orchestra is a real pleasure to play, and proves that the traditional co-op genre is still very much alive and very relevant in today’s golden age of boardgaming. Happy Gaming!